"See All Pics at MLS # 3469263"
Fabulous, Beautiful Ranch with Updated Kitchen & Baths. Hardwood floors & spacious Finished basement.Enjoy this Kitchen w/Center Island, Bar seating, Maple Cabinets, Black Granite,stainless appliances 5 burner Gas Stove, Bosch DW, separate dining area with outdoor views to a raised patio & private back yard. Hardwood floors throughout 1st floor, 3 bedrms, 2 Updated full baths, on main level with large Living rm. area. Master bedroom w/Master bath. 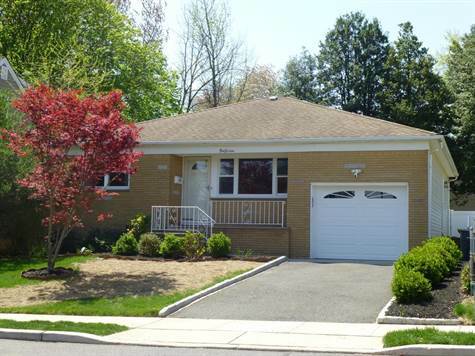 Great Lower level, Finished, Tiled flooring, large Family Room & separate Office/Den area & updated 1/2 Bath. Also, separate Laundry Rm. Storage Rm. & Utility Rm. Lots of beautiful finishes. Gas HWH, Newer Windows. Large over-sized Garage with New Garage Door & Opener. Lovely Home, Great floor plan & wonderful yard. Come soon & see for Yourself. Call Virginia Rea, 732.809.6290 for any questions you may have.